This item is only available on a Call-In basis. Please call 1-800-510-6468 to speak to a representative. The First Moon Walk: From the Astronauts’ Pockets to Your Collection! Everyone remembers where they were and what they were doing when this remarkable achievement in human history occurred, but few can grasp all the years of preparation needed to make it possible. Fewer still know about the special payload that was blasted into space along with Armstrong and his fellow Astronauts Edwin “Buzz” Aldrin and Michael Collins on the Apollo 11 mission that made history. Besides all of the technical gear and equipment necessary to get them to the moon and back, the trio also carried with them a small cache of medals that were designed and minted exclusively for the astronauts! Starting with Apollo 7, the Robbins Company of Attleboro, Massachusetts began working with one or more astronauts from each mission to design and strike medallions that would travel aboard their flights into space. Paid for by the crews and available for purchase only by NASA astronauts and members of the Astronaut Flight Office (AFO) support crew, these sterling silver mementos usually had very limited mintages of only 100 to 450 medals per mission. Today, these prized medals sell for tens of thousands of dollars at auction. The fact that the Robbins medallions actually flew aboard the space missions, were closely associated with the astronauts, and are seldom available and only in restricted quantities make them highly sought-after collectibles on the few times they are available. 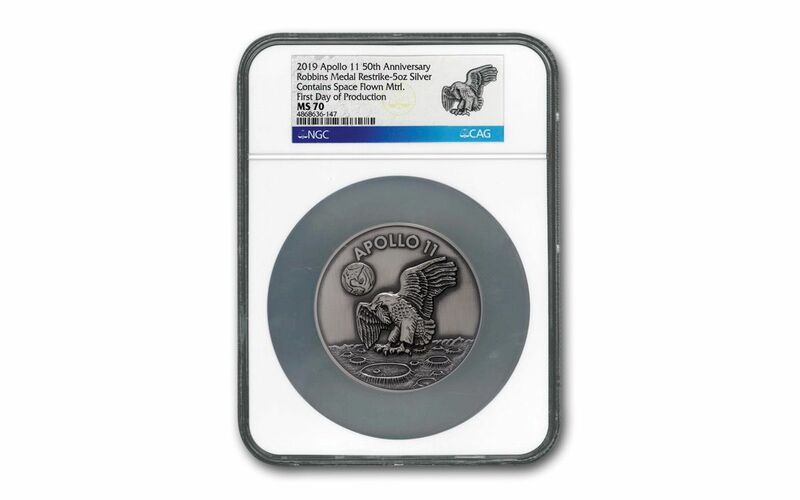 But now, thanks to GovMint’s standing in the numismatic world, we have been able to partner with Neil Armstrong’s son, Mark, to use the original dies of the historic Apollo 11 Robbins Medals and made new dies to create these commemorative medals celebrating the 50th anniversary of the Apollo 11 mission! 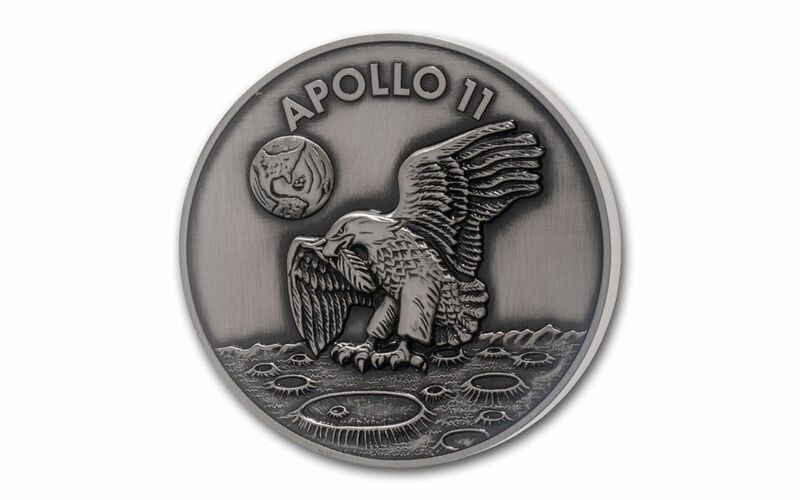 Struck in five ounces of 99.9% silver, this Apollo 11commemorative replicates the original medal’s design with an American Eagle landing on the moon on the obverse. On the reverse you’ll find the three names of the astronauts and the Launched, Landed and Returned dates just like on the original medal. In celebration of this historic event, the engravings of “50th Anniversary” and “1969-2019” have been added to the design. This amazing piece also features a classic antique finish that gives it a timeless look and feel. In addition, each silver medal has also been selectively layered with a metal alloy that has actually flown on an Apollo mission! Your Apollo 11 50th Anniversary Commemorative Five-Ounce Silver Medal has been graded by the Numismatic Guaranty Corporation (NGC) as being in flawless Mint State-70 (MS70) condition, a distinction that means your perfectly-graded medal will have ZERO imperfections – showing all features and fields exactly as the engraver and mint intended! In addition, NGC has certified it to be a First Day of Production (FDP) release, meaning that it was struck on the first day that the mint began striking it. To qualify for First Day of Production, strikes must be received by NGC or an NGC-approved depository accompanied by documentation from the mint that confirms that it was were struck on the first day of its production. Each medal will arrive in its own presentation case and accompanied by a numbered certificate of authenticity and an informative storycard. Coin collectors, history buffs, fans of space and science, and people who enjoy owning pieces of Americana will all be clamoring for this historic medal. Just 5,000 will ever be struck, however, so order yours now! NOTE: A portion of the proceeds will benefit charities endorsed by the Armstrong, Aldrin and Collins families. MEDALS MADE FROM ORIGINAL DIES – These Apollo 11 Fiftieth Anniversary Silver Medals were made from the original dies used by the Robbins Company to strike an extremely limited number of medallions that traveled aboard the mission. The Robbins Company worked directly with the astronauts to create a medal replicating the mission patch design that featured an American Eagle about to land on the moon with Mother Earth floating above in the background. The medal’s reverse includes the names of the astronauts – Armstrong, Collins and Aldrin – along with the dates of launch, moon landing and return. On the original medals that flew in space, the dates were left blank and were to be engraved upon their return to Earth. STRUCK IN HIGHLY-PURE SILVER – Your Apollo 11 Fiftieth Anniversary Commemorative Medal is struck in five ounces of 99.9% silver. 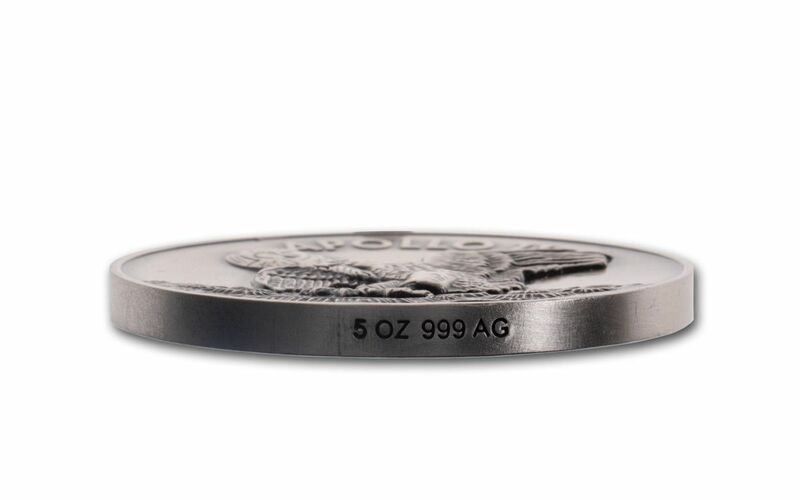 You’ll see this silver purity engraved on the medal’s edge where it reads: “5 oz 999 AG.” In addition, each silver medal has also been selectively layered with a metal alloy that has actually flown on an Apollo mission! GRADED IN FLAWLESS CONDITION – Your Apollo 11 50th Anniversary Commemorative Five-Ounce Silver Medal has been graded by the Numismatic Guaranty Corporation (NGC) as being in flawless Mint State-70 (MS70) condition! KEY FIRST DAY OF PRODUCTION CERTIFICATION – In addition, NGC has certified your commemorative to be a First Day of Production (FDP) release, meaning that it was struck on the first day that the mint began striking it. EXTREMELY LIMITED EDITION – Just 5,000 of these Apollo 11 50th Anniversary Commemorative Five-Ounce Silver Medals will be struck. 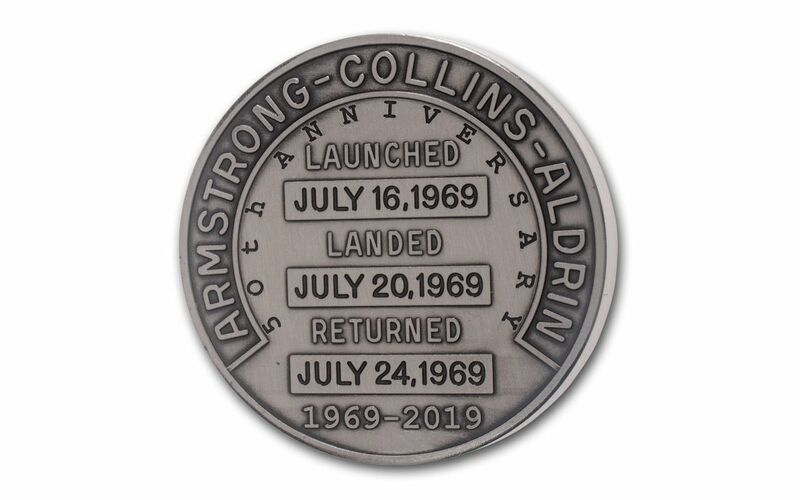 EXCLUSIVE RELEASE – To commemorate the 50th anniversary of this monumental event, GovMint has partnered with Neil Armstrong’s son, Mark, to use the original dies to create these Apollo 11 Fiftieth Anniversary Commemorative Five-Ounce Silver Medals. The medals will be struck for one year only from July 20, 2018 through July 20, 2019 – the 50th anniversary of the day that Neil Armstrong became the first man on the moon. 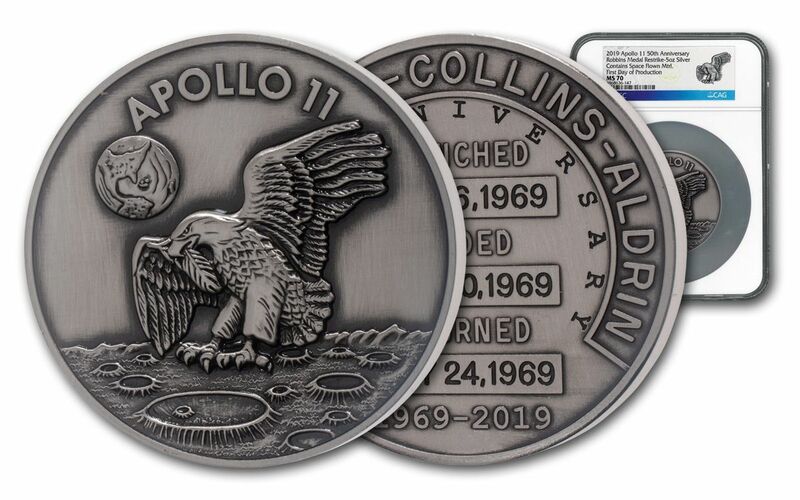 If there was ever a numismatic collectible that was described as being “out of this world,” it would be these Apollo 11 Fiftieth Anniversary Commemorative Medals. Secure one now and own a piece of history!